The modern yet petite San Leandro Korean restaurant offers limited seating and menu options, but delivers on quality and taste. The spicy pork bibimbap came with an exceptionally generous portion of lean meat that was spicy without being too salty. On a recent Saturday around lunchtime, Maejoo, San Leandro's newest Korean restaurant, was buzzing. There are only about 20 seats in the restaurant, but nearly all them — including the two sidewalk tables outside — were full. From a group of retirees to a young family with a toddler, who ate his bibimbap with a pink plastic spoon, Maejoo's audience seems to include everyone. Owner and chef Soojin Kim, a graduate of Le Cordon Bleu in San Francisco, is accustomed to cooking for a wide audience. According to Kim, prior to opening Maejoo in April, she ran a catering company, Chez Maejoo, where she made lunches inspired by a variety of cuisines for tech companies like Apple and Netflix. Before that, she was head sous chef at Zynga. "But I'm a chef, so I need a challenge all the time," Kim said. When Kim came across the tiny storefront located in San Leandro's Pelton Center, she decided it the was perfect spot to open a Korean restaurant. Kim calls Maejoo her "test kitchen," where she perfects a small number of Korean dishes with a contemporary twist. "My menu's very limited ... because I need ... consistency, quality-wise," Kim said. "I know what is the good consistency of real Korean food. I'm very confident I can make it." At Maejoo, you won't find offerings like black goat stew, blood sausage, or braised pig feet. The menu is simple and accessible even for first-timers to Korean cuisine; all the entrées fall neatly into categories like bibimbap, tofu soup, barbecued meats, and noodles. But each item delivers in quality and flavor. The meal begins with a free opener of baby carrots and cucumber sticks with a spicy, garlicky soybean paste for dipping. The soybean paste is made with a base of fermented soybeans called meju — which is where Maejoo gets its name. Meals also come with a few assorted, rotating banchan. On my visits, I received spicy, crunchy kimchi, as well as fishcakes with sesame seeds. Other banchan included seaweed salad, pickled daikon, and bean sprouts. You won't receive a dozen banchan like you might at other restaurants, but the important thing is that the banchan are well-made, and refills are gladly offered. For starters, the Korean fried chicken wings, half with sweet spicy chili sauce and half with sweet soy glaze, stood up to their competition. Despite being covered in sticky sauce, the wings maintained a crunchy crust, and the chicken was perfectly cooked and juicy without being greasy. The sweet spicy chili sauce had a hint of heat from gochujang, a Korean chili paste, which was tamed by sweet and tangy flavor. The sweet soy glaze had a nuanced, subtle flavor thanks to sesame oil, sugar, garlic, and soy sauce. The kimchi pancake was significantly thicker than kimchi pancakes I've had elsewhere, and looking at it, I assumed it wouldn't be crisp. I was wrong. Despite its thickness, the pancake had wonderfully crisp, caramelized edges, giving the onions, cabbage, and carrots a slightly sweet flavor. One unusual appetizer was the fried gyoja salad, available in pork and vegetarian varieties. Here, fried gyoja were tossed in a bright red, gochujang-based sauce, then mixed with a handful of shredded carrots, cabbage, yellow onions, and a sprinkling of sesame seeds and green onions on top. I chose pork gyoja, but they didn't have much meaty flavor. The gyoja didn't maintain as much crispiness as I would have liked, but the vegetables added pleasant texture and freshness. Kim said she invented this dish in an effort to make fried gyoja a bit more healthy. Thanks to her experience studying nutrition in culinary school and cooking for various diets as a caterer, Kim cares about the nutritional value of her food and her ability to accommodate various diets. "Personally, I love vegetables on everything," she said. 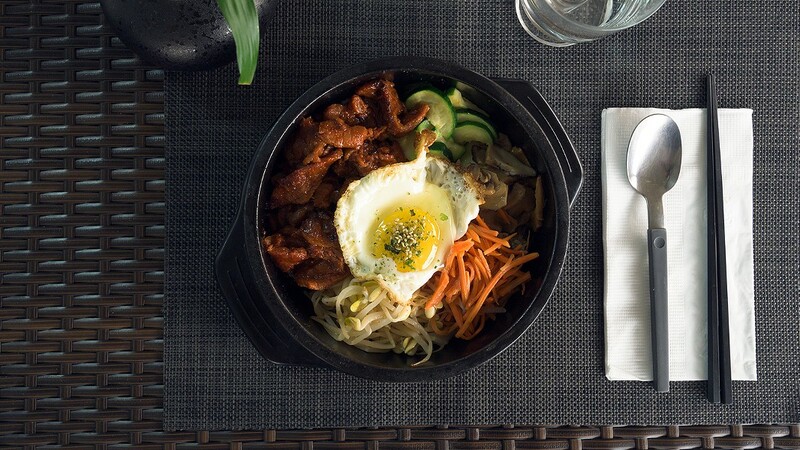 Those values rang true with the hot stone bibimbap, available with meat or tofu. The spicy pork version came with an exceptionally generous portion of lean meat that was spicy without being too salty. There was also a plentiful amount of vegetables, including bean sprouts, shredded carrots, mushrooms, and zucchini, as well as a perfectly fried sunny-side-up egg on top. The bowl came with just enough rice to cover the bottom and sides of the stone bowl, and the rice crisped up to a satisfying crunch. Kim said she ups the portions of meat and vegetables and serves less rice to make the bowl healthier and more satisfying. "That's why my stone pot is very healthy, nutrition-wise — less carbs, lots of vegetables." I was equally satisfied with the soft tofu soup. The beef tofu soup came with plenty of tender beef and soft, silky tofu, along with slices of zucchini and onion. The spice level is adjustable, and the medium spicy version had a nice kick. There was an impressive depth of flavor to the soup, made using a base of soybeans that Kim ferments herself. Importantly, the soup came out bubbling hot — plenty hot to cook, the egg served on the side. The barbecue meat dishes were also well-executed. The beef short ribs were tender and had just the right amount of fat, without any gristle. The house marinade wasn't too sweet, and the ribs had a bit of char around the edges. Kim said she uses a high-quality, expensive center cut for the ribs. Kim said customers sometimes complain about the price, but she's keeping it as low as possible without using lower-quality meat. "Profit-wise, it's not as good [of] an idea for myself, but ... my philosophy is, don't look at all the money or profit. Instead, I'm always following my passion. If people trust my passion, then I will eventually have a better business." As the sole cook at Maejoo, Kim works up to 14 hours a day. Her longterm goal is to introduce customers to more modern, nutrition-conscious Korean cuisine. On her days off, she develops new recipes. For instance, instead of the traditional Korean fried, whole mackerel, she plans to serve local filleted fish in a light sauce. Hours: Tues.-Sat. 11:30 a.m.-9:30 p.m.